Since the HoneyBaked store in Belmont closed a few years ago, I have make a one-hour trip to Palo Alto’s HoneyBaked every Thanksgiving/Christmas for our HoneyBaked Holiday Dinner. The primary target of the trip wasn’t the ham nor turkey, but HoneyBaked creamed corn! This year, I convinced EK that I will try to make creamed corn myself, so I can save the one-hour trip and standing in line for another hour just for a side dish. This is nowhere close to the HoneyBaked creamed corn, but 15 mins in my kitchen in exchange for 2-hour trip to Palo Alto is a good deal! 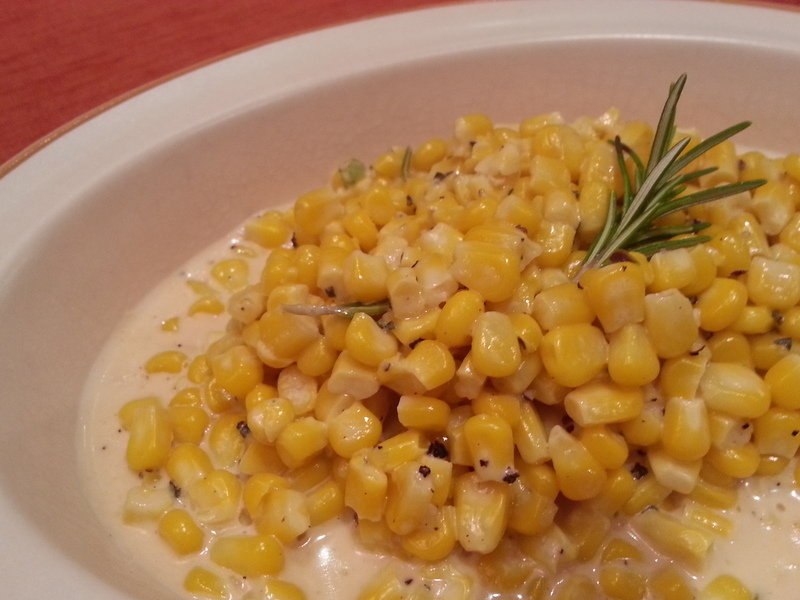 In a skillet over medium heat, combine the corn, cream, salt, sugar, pepper and roast chicken dripping/butter. Whisk together the milk and flour, and stir into the corn mixture. Cook stirring over medium heat until the mixture is thickened, and corn is cooked through. Next time, I will pulse half the corn in the food processor before cooking.